Have you ever clipped something from the web or pasted some image in OneNote and realized that it is not quite right? Word, PowerPoint and even Excel enjoys rich picture formatting features, while OneNote is about quickly capturing information and not much about fine detailed presentation of it. Still it wouldn't hurt to be able to crop an image you just captured to reduce the clutter and unwanted content. Well, Onetastic now supports a new context menu item for images: Crop. Just right click on an image and select Crop at the bottom and you will be able to cut it the way you want. Finally when you click Accept, your image on the page will be cropped and replaced. If you need to crop it further, you can keep doing so. If you want to learn more about other features of Onetastic, read the earlier post here. If you want to get your hands on the add-in quickly head to the download page. So have you installed Onetastic yet? How was your installation experience? Anybody had any issues? Do you prefer to access OneCalendar as a standalone app or from within OneNote? Are there other features you want to see either in the add-in or OneCalendar? Do you want to hear about how to develop tools for OneNote or my experience going through it? Let me know your comments below and help me improve it. Has anybody incorporated cropping into a macro? I searched Macroland, but found nothing. I'm trying to find/create a macro that crops out the margins created from a printout of presentation slides so that the slides are arranged in a tight vertical alignment so that I can type my own notes to the right. JUST PAID FOR IT and it works. Just have to say ITS KICKA$$ upgrade to note! yes its the .0 version so I need the paid version to be able to crop ? I don't care paying as long as that is what the problem is, its such an incredibly awesome upgrade it be worth every penny! So is that the reason I guess its not cropping? I was thinking this was soo good I d pay in a minute for it since its is so great. it worked fantastic then stopped working all of sudden for no reason, its soo needed. I used to see the option to crop on an image (right click) but since the latest update it has disappeared. When viewing in OneNote Online the image is shown without the cropping edit. When you print PDF to onenote which you do constantly at college it puts a blank frame around the image. Most of my professors PDF's are 40 pages long so I have to go to each one and cut off this frame. Is there anyway to crop multiple pictures at a time? I keep getting an error message/box that only states "The object does not exist." when I attempt to crop an image. Any idea why? Fixes? Lili: Can you send an e-mail to support@getonetastic.com to follow up with your issue? - Crop and Select Text from Image doesn't work. Its window doesn't show images at all. Crop returns 'The xml is invalid'. This is a much-needed add-in for OneNote! Thanks for making so many useful tools available to enhance OneNote capabilities. I'm really interested in a macro that can automatically include metadata when pasting images. I mostly would like to figure out how to include the date the photo was taken along with the size and original location of the file. I've looked at the macro editor feature and am not sure if this is something it can do. Any advice would be appreciated! Once I crop an image the text within is no longer searchable. What am I doing wrong? Thank you! I second sceiler's idea of multiple image cropping! Great software. Thanks for the great work. Is it possible to make this into a macro and applying the cropping to all images on a page? This would be similar to "set all images to background" or "resize all images by value x and y". Should this work in OneNote 365? If so it's not showing up in mine. Thanks. KMAN400 It seems to be working just fine for me. Synced between desktop, metro and android applications, all is consistent. Sorry for bumping this, just wanted to clear this up. When I use the Crop Image feature it works great as long as I am opening the Note in the Desktop program (on versions with and without Onetastic installed). However when I access the same note using the web App from Microsoft web page or the App on my phone (Android), I get the whole uncropped image compressed into the size of the cropped image. I use it for screen shots, and I have multiple monitors, so the image get squeezed a lot sometimes. Just a quick question. Is it possible to Copy and Paste part of an image with your software? Xenia: Crop command is on the right click menu of images. So right click the image you want to crop then choose Crop. This looks fantastic but I don\'t see it anywhere in Onetastic after I download? I only see the ability to size an image? Where do I find these commands? I see that an image quality is reduced after it is cropped. Do you see that too ? brainstewn, was this a regular image or a printout? You can e-mail me the page and I can have a look (See the contact link at the top). I tried the cropping feature but its not working on my 2013 trial. I crop the way I want it to look but the end result crop is cutting off the top left portion and showing the bottom right (blank) area. I think this is because I rotated the image 90 degrees left before cropping. Switching keyboard layouts makes some sense: OneNote always seems to revert to the language corresponding to the keyboard layout/IME at the time of import. I tried importing an image with the input language set to Chinese Traditional, and it tried to run OCR for Chinese. I then changed the language to English, ran OCR again, did the crop, and it reverted to Chinese. Even after changing OCR languages twice--changing to English, then to Japanese, then cropping--it always reverts to the language it was imported with. On the other hand, this would mean installing a lot of keyboard layouts I wouldn\'t use otherwise. I work with scanned material in multiple languages (English, French, German, Chinese, and Japanese), and don\'t need all these layouts (and some of them wouldn\'t work well with a US keyboard). I\'m used to having to manually set the language for OCR after importing the image, so I\'ll just have to remember to do so again after cropping. It\'s too bad that the API doesn\'t expose this, though. Bruce Rusk, what is your keyboard layout when doing crop? If it is not a FR layout, can you try with switching to a FR layout when doing crop? I believe OneNote doesn\'t tell what the OCR language for an image is and won\'t let me set it after crop, but instead it should use the keyboard layout as an indication of the language to be used. I use the crop feature all the time, and have one small suggestion for an improvement: after cropping a page that has had its text OCRed, if the language chosen for the OCR was not the default language, the OCR reverts to the default (for example, I had scanned a document in French, set the recognition language to French, then cropped it--and it reverted to English). Is there a way to have the image retain its language setting? I appreciate very much you r etvaulaion. I am a user of One Note for 3 years with hundreds of posts. I use it for every note on my job and for personal tracking info.I have to comment that One Note has an very important issue that is the virtual printer with renders any file to it, allowing to make notes, highlights, etc.. I read every technical paper or even reviewing PDF files sent to me this way, because then I export all the drawings and notes to dhml (publish feature of one note) and then send back through e-mail. Very Nice.I intend to use Evernote *just* for keeping *web* notes from pages. Pieces of pages that interests me.For pages that I want to see afterwards, etc, I prefer to use del.icio.us with the tag pending on it (although I never come back to see them).I have re-installed Evernote after reading your post, in fact searched by google when I was trying do find if evernote is indexed by Windows Desktop Search 4 that comes with SP2 of Vista.The organization of One Note (and I am a organized guy) is *much* better than Evernote, that is more like a sandbox tagged Well, thats it. I will use both for a while, One Note forever for sure! Evernote who knows for web clipping *only*. Onetastic by itself is you got it fantastic. And then I opened up the calendar. it shows me everything I\'ve done since I loaded the program. And that\'s not good enough you click and go to the page relating to the calendar event. Maybe this is already part of OneNote somewhere which I have never found. But as is stands this is a great addition OneTastic - Calendar. Thanks again! Does anyone out there know of any other plug-ins that I\'m missing out on. All the time that I have wasted every day without the knowledge of OneTastic. Bruce, I will check out the scenario you describe and see where the error comes from. Thanks for reporting this. Today I sent an outlook email with PDF attachments to a password protected section of OneNote. It gave me the usual warning that the attachments would not be password protected. That is OK, because I normally insert them as printouts on sub-pages in OneNote and delete the attachments then. I copied the first PDF to a new page, and after pasting I inserted as printout (2 pages). I deleted the second page as it had no revant information. That gave me the banner at the top \"One or more pages .....\". I clicked on Onetastic\'s \"Cleanup Printouts\" and got an error dialogue \"Unknown error 0x8051100F\" with only an OK button. It was repeatable. I repeated the exercise on a page in a non-password protected section and your cleanup tool worked fine. I can work around that by inserting the printout on the main page and cutting and pasting the printout images to the sub-pages. Just thought you may not have come across this issue and that it might be easy to tidy up if you do another version. Thanks again for a nice add-on tool. For a big image, such as 567 x 3908 pixels, to me it is hard to see the area to be cropped. If the crop small-window size can not be customized, is it possible to have the image restored as original size and, then, up/down scroll bars appear ? Omer, thank you for this great add-on for OneNote. I have just installed and tried each feature and it is fantastic. Plugs some holes that badly needed plugging in what is otherwise a very good product (OneNote). I love the calendar feature that let\'s me see the pages by date modified. I have wanted that since I started using OneNote. Having the same page showing a second time on the date created is good, and I would not want to see that go, but an option selector to choose one, or the other or both (dates) would be useful I think. Crop functionality and Cleanup Printouts are slow to respond, and there is no indication that the system is \"processing\", so maybe a message box or some other \"processing is happening\" indicator could be useful. But these suggestions should not be seen as diminishing a fantastic OneNote add-on with well thought out functionality. Well done and thank you again! Thank you, thank you, thank you! Fantastic tool. When you get the time, I\'d love a tool that allows you to format tables as you do in other Office products - althought I think this is a giagantic task. dirmansyah, you can hit Win + S when OneNote window is open to get a screen clipping of OneNote window itself. The crop feature does not know about overlapping content and does not try to fix the positions of them. There is a clip (image) of a html page and I have added some marks (pen/highlighter/shapes) on it. 1. If I crop the image, how to keep those marks on their positions ? Can those elements be temporarily treated as one item (merge) before being cropped? 2. Can ON2010 clip the screen of itself ? Should I use another application for this purpose? Malte Ahrens, thanks for your interest. 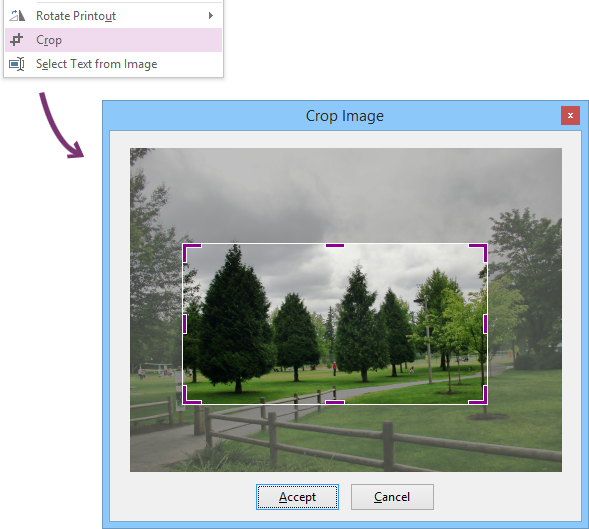 The crop feature should work for png, jpg and emf, which are the only types that can exist in OneNote. The other types are converted into one of these upon insertion. In fact, the screenshot above is a jpg file from my digital camera. There might be something to do with the particular image you are trying to crop. Please contact me by e-mail using the Contact link at the top, so we can troubleshoot the issue. Of course this might be a bug in Onetastic, in which case I would like to find and fix. With the new crop feature (which I love, by the way), it seems like it only works with png\'s and not other filetypes (I get a \'Custom UI runtime error\' from the function \'OnCrop\' when I try, for instance, a jpg file). Would you consider adding support for other filetypes (especially jpg)? I think it would be better if you add \"version\" or \"modified date\" to your zip file (or exe/installer file, if possible) of Onetastic or OneCalendar. It is good to avoid unintentional overwriting the newer one with the older one when we organize our files. I have just tried if installing Onetastic then OneCalendar then Onetastic again would make a problem; and I unintentionally installed the old Onetastic and could not find the \"crop-image\" feature. :) Sometimes I forget to pay attention to the modified date column in Windows Explorer, but the version stamped in the file name (zip/installer) reminds me to do so before installing. And, I saw no problem after trying the above. Omer, thanks for considering my requests and for giving the \'tricks\' about one instance only and F5 key. I agree with you about the end of the calendar which is +2 years from the current year. I thought 2014 was absolute. dirmansyah, I will consider the request to exclude created or last modified date, as well as going to Today and running as single instance. Currently OneCalendar can be run multiple times, each time opening in new window. One way to achieve something similar would be to download the standalone version and pin it to your taskbar (in Windows 7). Then you can just click on the icon on the taskbar to access it, and it will be as if it is single instance. To refresh OneCalendar, you can hit F5. This will re-read the pages from OneNote, equivalent of closing and opening it. For the date, it will show between 2000 and two years from current year. In 2014 you will see that it shows up to 2016. There is no particular reason for this. I didn\'t consider anyone to use it as a calendar to look up future dates, and didn\'t expect any notes in the future. 5. Is \"One Instance Only\" applicable for OnceCalendar ? 1. The created date of the page, which is the date under the title. 2. The last modified date of the page, which is the date you last edited content on a page. This may be different than the created page, if you edited a page after you created. 1. Could you provide option to *exclude* the created date ? If I modify the Date field (say, to 2 days forward), the result is as if I had two identical items. Seeing the calendar, I become confused. To me, the last modified date is enough. 2. After modifying something, what should I do to make OneCalendar refreshed. Should I close it and open again ? Is \'refresh/reload\' feature not applicable ? 3. After moving back and forward among the dates (say, in Week-View), how can I quickly go to current date ? I can not find \'today\' button. 4. What is the reason so that OneCalendar is ended with the year 2014 ? Is it a limitation ? I have installed Onetastic on my laptop with Windows7 and it works as expected. Oh, I am very sorry Omer. Big mistake on me. I am using my laptop with *XP* right now. The other one is with Windows7 and I usualy use it; not this one with xp. I try Onetastic on the other laptop. Omer, I have downloaded Onetastic (32-bit). When I tried to install it, a message appeared saying \"Installation Failed: class not registered\"